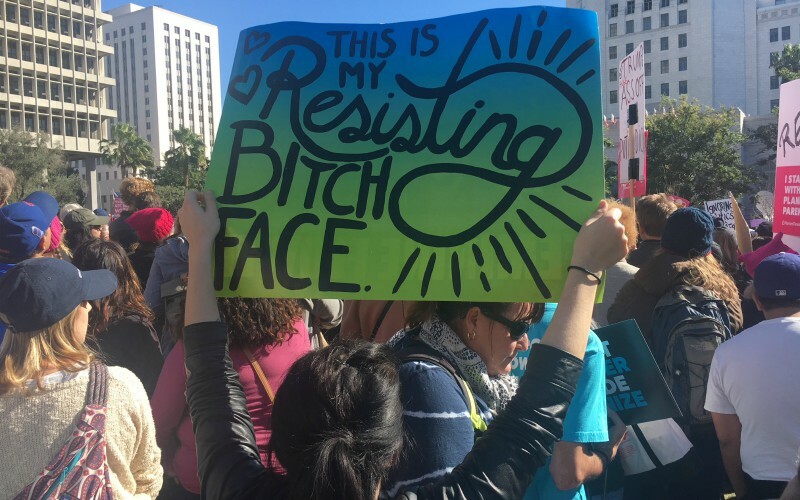 Home Art Our Favorite Signs and Slogans From the 2018 Women’s March in L.A.
Our Favorite Signs and Slogans From the 2018 Women’s March in L.A.
On Saturday, an estimated 400,000 people (based on the view from KTLA’s chopper) flooded the streets of downtown Los Angeles for another massive Women’s March from Pershing Square to City Hall. Donald Trump’s first year in office has been everything self-identified members of the Resistance might’ve predicted, with some unforeseen horrors sprinkled in. Capitalizing on the President’s own creative language (for instance, his recent reference to “shithole countries”), many marchers carried signs that skewered the Trump administration and its positions on everything from women’s health to immigration; others used the opportunity to rep the #MeToo and Time’s Up movements. The mood at this year’s march may have been more subdued (hey, it’s been a rough 365), but the creativity was going strong.